there's been some debate in the blogosphere about how much of a good thing the whole leopard trend is, and quite honestly, i think there are quite a lot of misconceptions about animal print. there is a spectrum, shall we say, where on one end there is Jersey Housewife, while on the other end are the Emmanuelle Alts and Alexa Chungs. i don't see why with some careful selection (all leopard prints are obviously *not* created equal) and attention to color, texture and silhouette, one can choose a timelessly chic leopard accessory or coat (faux, of course!). i feel much more free to wear leopard in my 20s right now, i think because it's such a fun way to incorporate pattern and texture with style and a little bit of subversion. 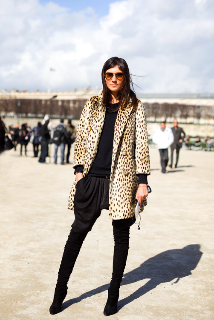 last but not least, emmanuelle alt pulling off the leopard coat against all black, with OTK suede boots - perfection!! I like the charcoal leopard-print pants that Topshop makes. However, I don't think I'm tall enough for the capri-length version they are selling now. hey ashley - you could always get the pants and take them to your tailor for hemming. Apiece Apart's collection is really strong this season! a lot of other bloggers have been raving about the line. APC and Steven Alan are always great places for timeless pieces. have you tried looking at vintage shops for boxy 'lady bags' that are similar to the Celine one? Thanks for the advice, Sophie. To be honest, I hadn't thought about a tailor or vintage shops. I'm kind of a bad fashion fan, because I rarely utilize either! I'll definitely keep my eye on those Topshop pants now. I'll also check vintage shops for similar bags. I never liked Phoebe Philo for Chloe as much as I felt I should have. And my tastes have changed a bit since then. But I love what she's doing with Celine. I finally understand why everyone's obsessed!